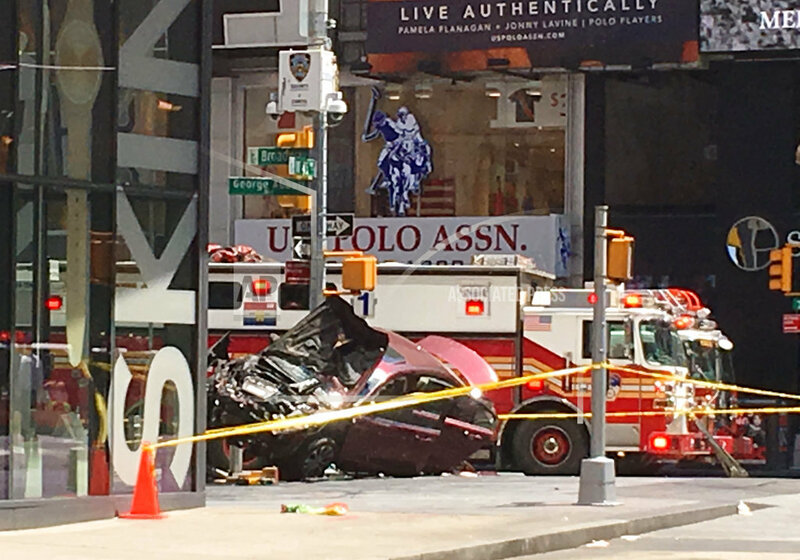 NEW YORK (AP) — A man steered his car onto a sidewalk running through the heart of Times Square and mowed down pedestrians for three blocks Thursday, killing a teenager, then emerged from his wrecked vehicle wild-eyed and waving his arms before he was subdued by police and bystanders. The driver, a 26-year-old U.S. Navy veteran, told officers he was hearing voices and expected to die, according to two law enforcement officials. Helpless pedestrians had little time to react as the vehicle barreled down the sidewalk and through intersections before smashing into a row of steel security barriers installed in recent years to prevent vehicle attacks on the square where massive crowds gather every New Year’s Eve. The car came to rest with its two right wheels in the air. Police said 23 people were hit by the car, including an 18-year-old woman who died. The woman’s 13-year-old sister was among the injured. The carnage raised immediate fears of a terrorist attack, but investigators quickly turned their focus to the sobriety and mental health of the driver, identified as Bronx resident Richard Rojas. Photographers snapped pictures of Rojas after he climbed from the wrecked car and ran through the street before he was tackled by a group that included a ticket seller and a muscular door supervisor at a nearby Planet Hollywood restaurant. Rojas initially tested negative for alcohol, but more detailed testing was being done to determine if he was high, according to two law enforcement officials who were not authorized to speak publicly and spoke to The Associated Press on condition of anonymity. A week ago, Rojas had also been arrested and charged with pointing a knife at a notary, whom he accused of stealing his identity. He was arrested on charges of driving while intoxicated in 2008 and 2015, Police Commissioner James O’Neill said. He pleaded guilty to an infraction in 2015 and was ordered to complete a drunken driving program and lost his license for 90 days. Neighborhood acquaintances in the Bronx said Rojas was a friendly man who had been having problems. Harrison Ramos, 30, said Rojas wasn’t the same when he came back from active duty in 2014. Rojas enlisted in the Navy in 2011 and was an electrician’s mate fireman apprentice. In 2012 he served aboart the U.S.S. Carney, a destroyer. He was most recently based at the Naval Air Station in Jacksonville, Florida, and was discharged in 2014. Police said Rojas had been driving south on 7th Avenue when he made a quick U-turn at 42nd Street and drove up the sidewalk for three blocks, passing tourist draws like the Hard Rock Cafe and the Bubba Gump Shrimp Co. restaurant. As Rojas ran from his wrecked vehicle, Ken Bradix, a door host supervisor at Planet Hollywood, struck him to get him to stop, Balde said. The apartment building where Rojas lives was cordoned off by police Thursday. It wasn’t clear when he would get a lawyer or face formal charges in court. Tags: #richardrojas#terrorism, #rojas, Car, died, Hit, Navy, navyveteran, people, vetern. Bookmark the permalink.